Now my mom has been making these for years, and mainly they get made at Christmas but honestly, I could eat these year round!! It probably is safer for my waistline to only have them once a year. 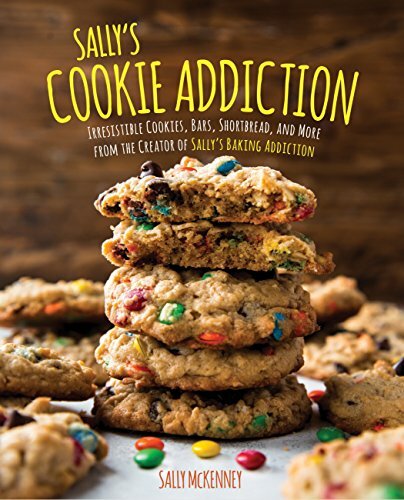 Sally’s Cookie Addiction: Irresistible Cookies, Cookie Bars, Shortbread, and More from the Creator of Sally’s Baking Addiction The Perfect Cookie: Your Ultimate Guide to Foolproof Cookies, Brownies & Bars Cookies: Top 50 Best Cookie Recipes – The Quick, Easy, & Delicious Everyday Cookbook! 70 mini Peanut Butter cups, unwrapped ahead of time!!! 12 oz. choc. chips (OR Red or green candy melts) This is for drizzling over cookies and can be skipped. 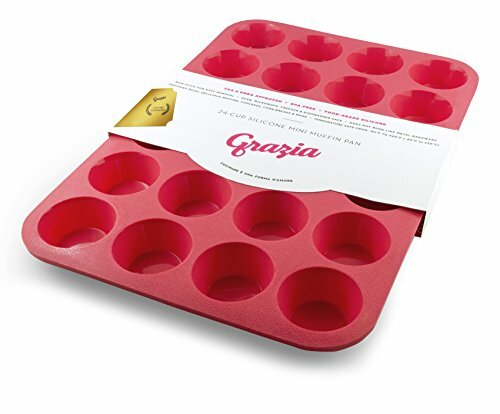 Place sheets of waxed paper on countertops UNDER cooling racks for you to drizzle the chocolate over the tops of finished cookies. Throw into your mixer peanut butter, Crisco, light brown sugar, milk and vanilla in large bowl. 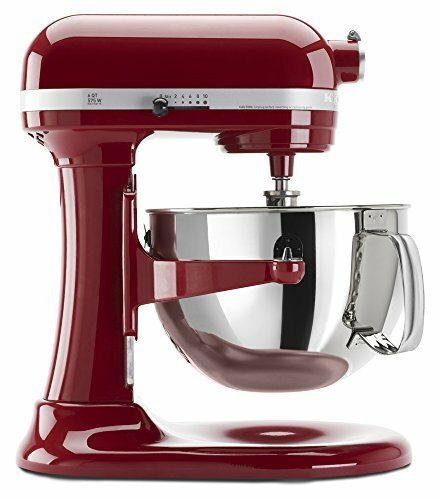 Now I love to drop it all in my Kitchen Aid Mixer and let the mixer do all the work. I don’t have the patience for mixing separately and combining, and it still turned out great. Mix at medium speed of electric mixer until well blended and then add eggs. Beat until JUST blended. Combine flour, salt, and baking soda in a separate bowl, or as I do dump all into the same bowl. Add to creamed mixture at low speed. Bake at 375 for 8-9 minutes JUST until set and barely brown. 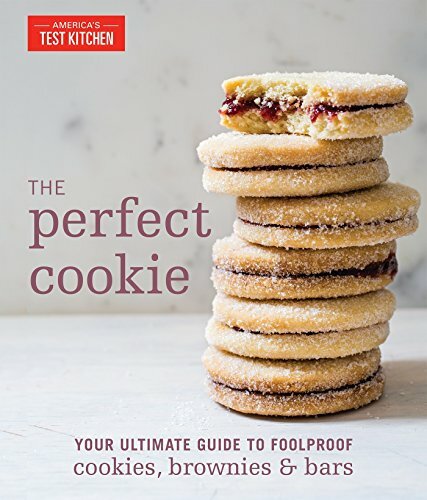 Cookies will be VERY tender and fragile at this point. 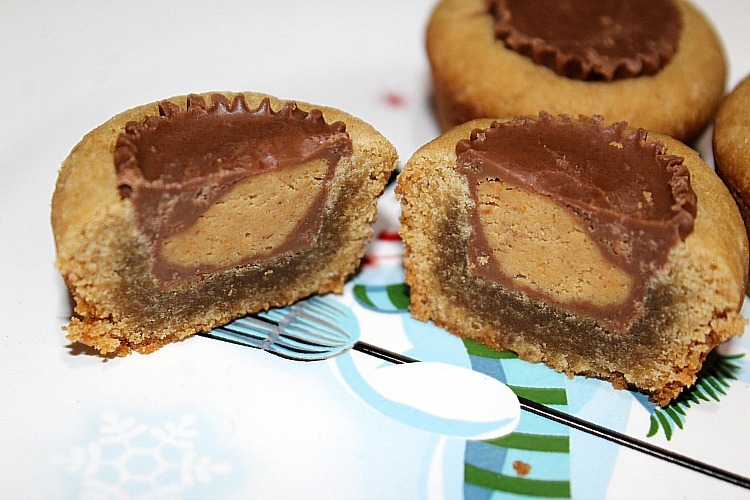 Immediately take unwrapped PB cups and press one into the center of each cookie. 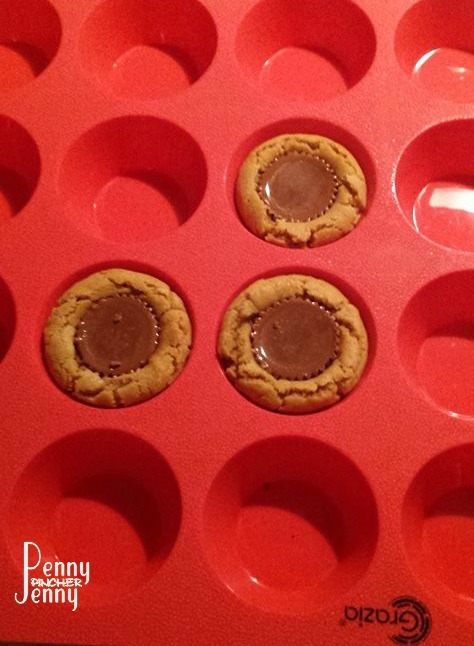 Remove cookies from pan and place cookies close together on a wire rack over waxed paper. 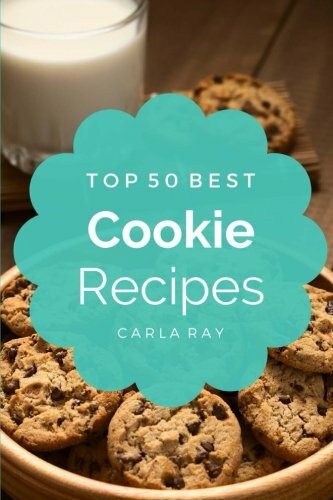 Bake all cookies before doing next step. 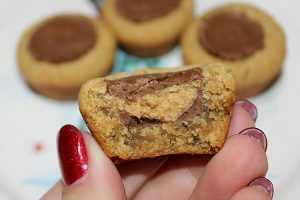 Melt chocolate chips in the microwave, stirring after 1 minute and then again at 15-second intervals until melted and smooth. Dip a small spoon in melted chocolate and wave rapidly, but carefully, back and forth over all cookies. Repeat this process until cookies are well decorated, then decorate with sprinkles if desired. Allow chocolate to set. 20 minutes in the fridge should work. 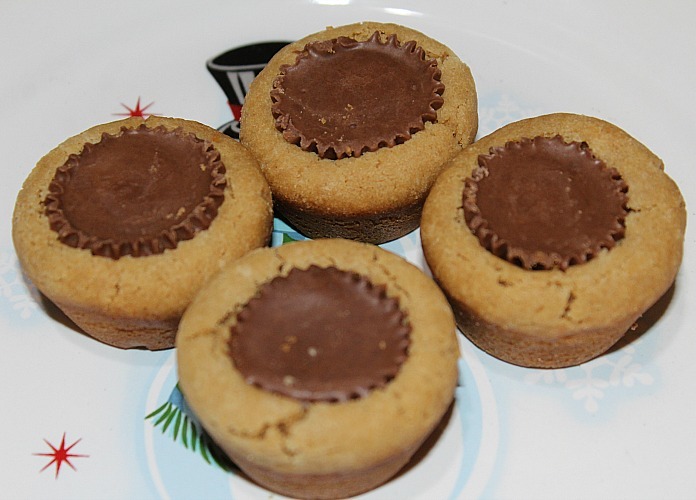 Enjoy now or freeze until solid in a single layer on a tray, then put in double wrapped foil/Ziplocs. What is your go to holiday cookie? 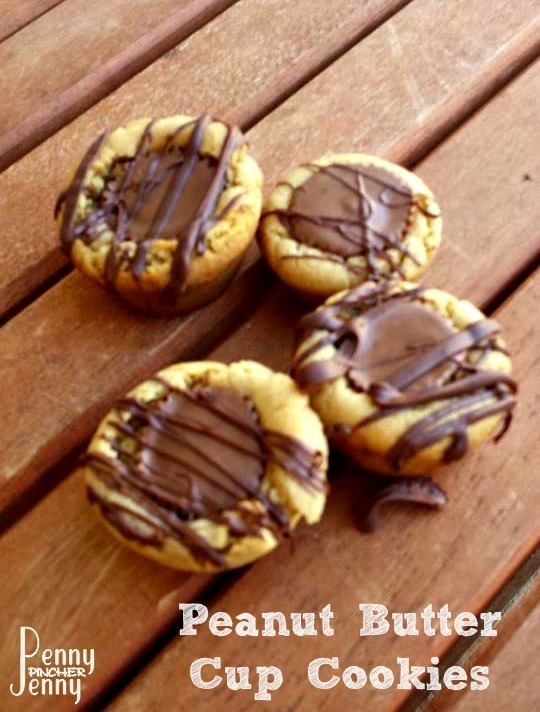 This Peanut Butter Cup Cookies Recipe is full of amazing peanut butter cookie flavor and a peanut butter cup! 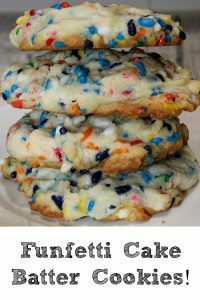 Made with muffin tins they are amazing! 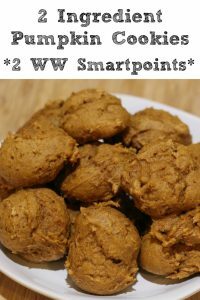 Throw into your mixer peanut butter, Crisco, light brown sugar, milk and vanilla in large bowl. 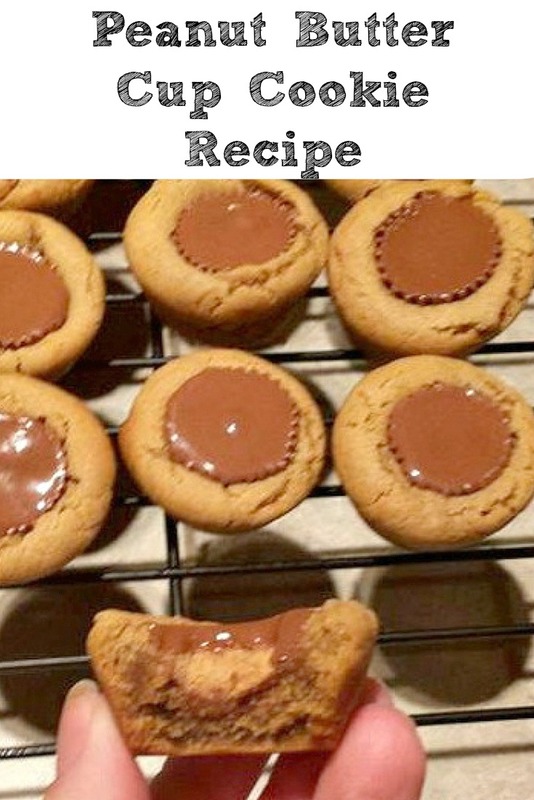 My only problem would be that I might be tempted to eat those peanut butter cups when unwrapping them – but it would be worth it to make these – so darling! and sound delish!!! These are so delicious looking!! 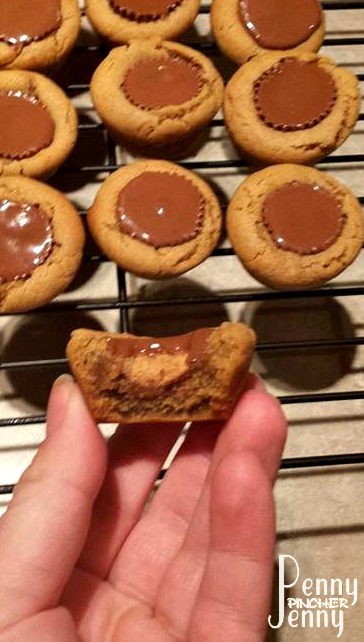 What a great idea to put a peanut butter cup inside of a cookie, I’m sure they are irresistible!! Pinning to make for our next family get together. Have a blessed week!! Peanut butter! Anything and everything peanut butter I love!